Why has India's Calcutta city banned cycling? Every morning Raju Sapui cycles to his employer's home in the eastern Indian city of Calcutta. Mr Sapui works as a driver, but like most people in this teeming city, he cannot afford to buy a car or two-wheeler to commute. But things have suddenly turned difficult for Mr Sapui. In a surprise move, authorities have recently banned cycles - along with hand carts and other non-motorised vehicles - from 174 key roads and streets in the city during the day. "This is making my life very difficult . Every time I get on my cycle I am scared that I will be fined as I have to break the law and go on some of the banned roads to get to work," says Mr Sapui. He is not the only one who is unhappy about people being told to get off their bikes. Commuters make more than 2.5 million trips on bicycles in Calcutta every day. It is also the only major city in India where the number of cycle rides is greater than the number of car journeys. So, at a time when most cities across the world are encouraging their citizens to get on their cycles, why are the authorities in Calcutta telling people to get off them? The answer, according to the police, is the growing traffic. Calcutta may have less cars than the cities of Mumbai, Delhi and Chennai but its narrow and congested roads cannot cope with the different types of vehicles that use them. Cars, cycles, buses, auto-rickshaws, motorbikes, cycle-rickshaws, hand-pulled rickshaws and tramcars jostle for space. Average traffic speeds are down to 8mph-11mph (14-18kmph), compared to India's average of 13mph (22kmph). "There is just not enough space for all kind of vehicles," says Dilip Kumar Adak, deputy commissioner of the city's traffic police department. "Cycles slow down traffic and removing them will make the streets safer and traffic speedier. "It's not a blanket ban. People can still cycle on smaller streets." No wonder cyclists are up in arms against the new rules. Cycling groups have launched what they have called a cycling satyagraha (people's movement), pushing their cycles through the city and organising protests against the ban. 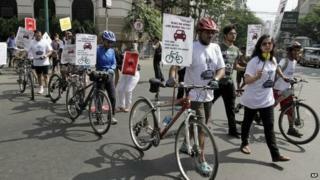 "The new laws are crazy," Gautam Shroff from one such group, Ride 2 Breathe, says. He feels "pollution is increasing every day here so we should be encouraging people to take up cycling". "Instead we are punishing them for helping improve the environment." Mr Shroff describes the police claims that the new laws will make the streets safer as "nonsense". "If cyclists are a nuisance, so then are pedestrians, motorcycle riders and car drivers. Why does the government not take them off the roads?" For Mr Shroff cycling is a hobby. For many others in the city, it's the only way they can get around. The police have already started fining those who are cycling on the main roads and have warned persistent offenders that they will confiscate their bikes. But if you walk or drive around Calcutta you will still see many cyclists on the city's major roads. Like Raju Sapui. "I will continue to use my cycle until the authorities take it from me. If they want me to stop riding, maybe they should buy me a car," he says defiantly. Video Is cycling Africa's next big sport?